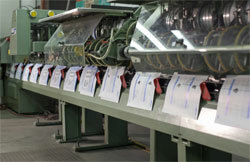 Binding | Pengad Indy Inc.
Our bindery department can handle most of your finishing needs. With automated stations for cutting, folding and sorting, we can complete 99% of the jobs in-house, saving time and money! Simply means that the covers are printed on the same paper stock as the inside pages, the most economical binding solution. Separate covers are available in a wide selection of finishes, colors & weights. This is the most economical way to introduce catalogs and generally can be used for documents with hundreds of pages, depending on the weight of the paper. Saddle stitch can be used for any size catalog or book up to 96 pages on paper weights up to 60# or 120 pages on papers up to 50#. Saddle stitch binding can accommodate a separate cover of heavier paper.